Friday 2 November 2018, Fairmont Waterfront Hotel, 900 Canada Place Way, Vancouver BC. The seminar runs from 9:00 am - 5:00 pm in the Waterfront Ballroom. 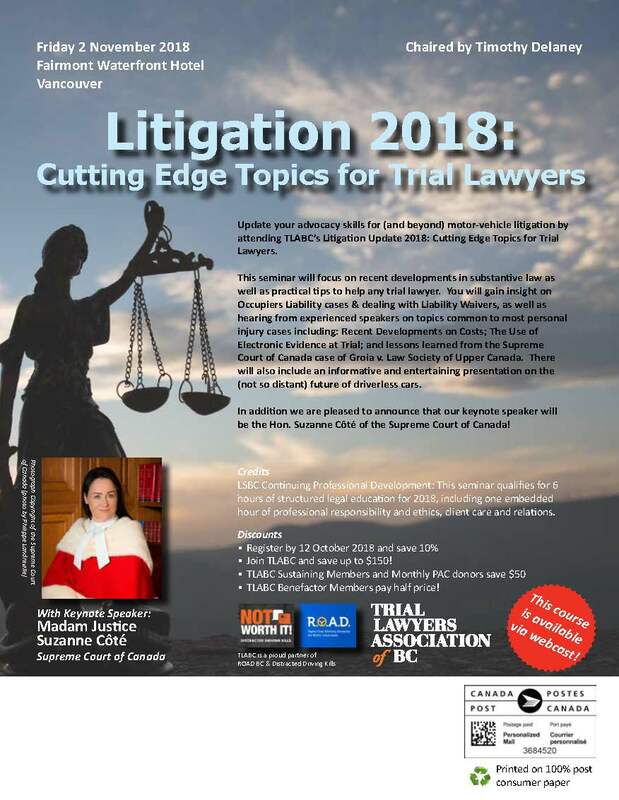 LSBC Continuing Professional Development: This seminar qualifies for 6 hours of structured legal education for 2018, including one embedded hour of professional responsibility and ethics, client care and relations. Join TLABC today - members save UP TO $150! The Fairmont Waterfront will offer a discounted group rate of $229.00 per night, plus taxes for November 10 & 11. To book click here or call 1-800-441-1414 and quote the TLABC rate, with booking code TRIA1118_001.